Happy Sunday to you! Today is my last Limelight guest designer post for the month over at the Flourishes blog. I hope you'll join me there, to see how I made this 4" x 4" tumbled marble tile drink coaster with my Copic markers and beautiful Flourishes Pears stamp set! Today over at the Flourishes blog I'll show you how I made this fun Valentine bookmark using their beautiful Winter Bouquet stamp set on an Inchie Arts white Twinchie Square, colored with Copic markers, and a paint chip sample. I hope you'll join me! Hello and happy Sunday! I hope you'll join me today over at the Flourishes blog for my Limelight guest post. 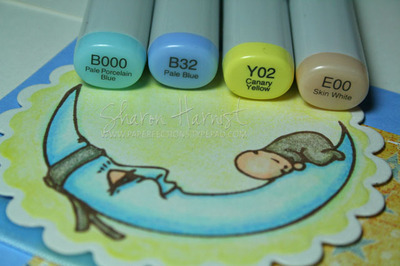 I have a Copic coloring tutorial, with some airbrushing tips, for my February calendar! Good morning, everyone ... I'm excited to be the Limelight Designer for Flourishes this month! I've always loved their gorgeous stamp designs, so I was very honored to be asked to design with them! I hope you'll check back in each Sunday this month, for some pretty Flourishes inspiration! I'm starting off the month with one of my very favorite Flourishes floral images, the Lenten Rose set, colored with my Copic markers, of course! You can find out all the details on how I created this card (or artwork piece?!!) over at the Flourishes blog today! Happy Sunday! Here's another sample from Flourishes' new Lilac set that was released last week. I chose to use SplitcoastStampers.com's weekly Color Challenge #167 (soft green, soft pale blue & navy) and Sketch Challenge #177, so almost all the choices were already made for this card except choosing the papers I wanted to use! 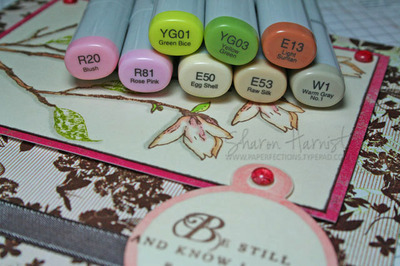 I was delighted to find Memory Box's Inspire paper pack has most of these colors! I added Stampin' Up's Night of Navy as a 5.5" card base and matting around the image I stamped onto a more solid sheet of this paper pack's colors. I used Ranger's Adirondack Espresso dye ink to stamp the image and then quickly clear heat embossed it while the ink was still wet. This gave me a good outline to add the Dark Blue Stickles for the lilac flowers. I used these Copic markers to color the leaves & branch: G24, G28, E25, E27; and T3 for shadows. 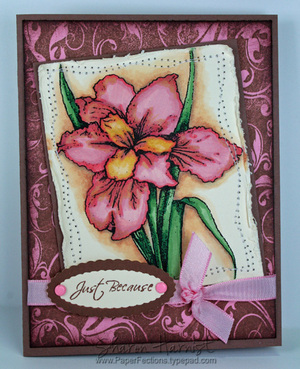 The sentiment is from Flourishes' Siberian Iris set. The edges of the focal image and mat were distressed using Tonic's Edge distresser. These layers are popped up on dimensional foam tape. A piece of striped paper from the Inspire pack was used for the right vertical element in this sketch, topped with Water Dew Drops. I let the pattern of the paper serve as the left vertical element of the sketch. A little paper piercing finishes off this card. Today's my 14th wedding anniversary, so I'm off to make a card for hubby and will post it later! 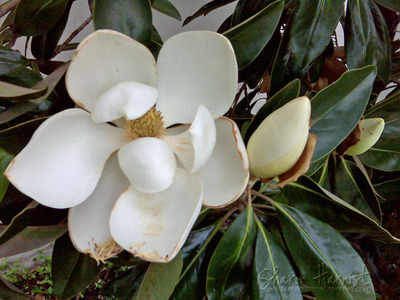 May magnolias -- I love them! And they currently ARE starting to bloom in Texas . . . I'll try to get a photo and post a little later today. Since they are just about my favorite flowering tree, imagine my pleasure when I first saw this beautiful set from Flourishes! The set is actually called "Lilac" but also includes this branch, leaf and two different magnolia blooms, so you can build your magnolias as you see fit. The main image is accented with Island Blossom Dew Drops and popped up on dimensional foam tape. The magenta mat and 6"x6" background paper are both BasicGrey Sultry. The sentiment is from Papertrey Ink's Everyday Blessings. 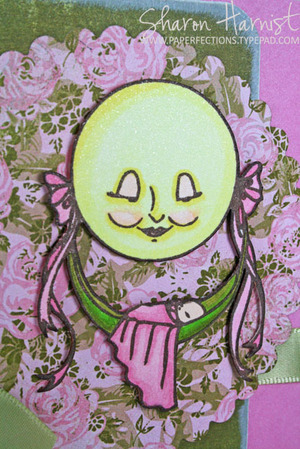 It was cut out using Spellbinders Variety Tags and colored around the embossed edges with R20-Blush Copic marker. Stampin' Up's Chocolate Taffeta ribbon finishes up this 6-inch brag book/photo album page. I'll have another sample from this stamp set for you next Wednesday, using the Lilacs . . . and check back Sunday/Monday to see my teacher appreciation cards. Enjoy the weekend! ETA: Here's a photo of our gorgeous Texas flowering Magnolias in May! 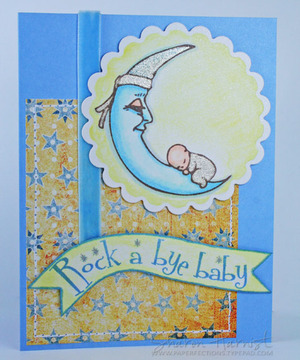 Here's another sweet baby card from Flourishes' beautiful new vintage baby set, Rock A Bye -- this time geared more towards a boy -- did I say how much I love this set?!! I used SplitcoastStampers.com Sketch Challenge #176 for the layout. Clear Stardust Gelly Roll pen was used on the moon's night cap and baby's clothes -- I liked the silvery sparkle, it looks like the twinkling moonlight! The hand-cut sentiment was stamped and airbrushed the same way as the moon image; both are popped up on dimensional foam tape. Light blue velvet ribbon (Michael's) looks like it's suspending the sentiment. Patterned paper is from BasicGrey's Oh Baby Boy collection -- it was faux stitched using a paper piercer and Ranger's new white opaque pen. 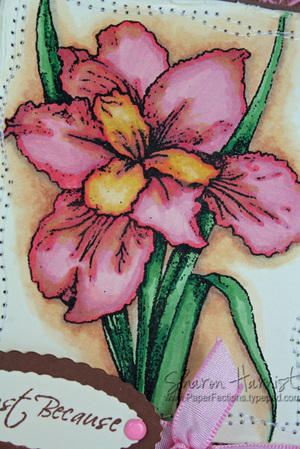 Notecard base is Memory Box Iris. 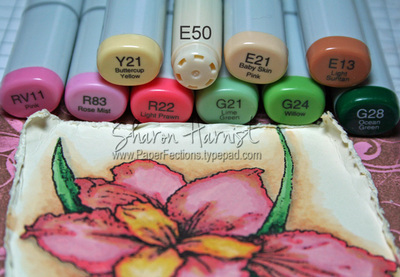 Supplies: Notecard, Copic markers & Airbrush System, Spellbinders Nestabilities all available from Ellen Hutson LLC. 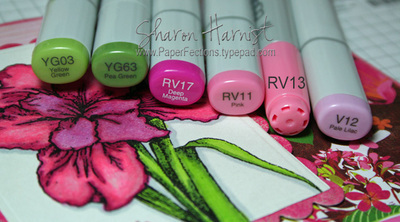 Rock A Bye stamp set, Stardust Gelly Roll & Ranger white opaque pens available from Flourishes. 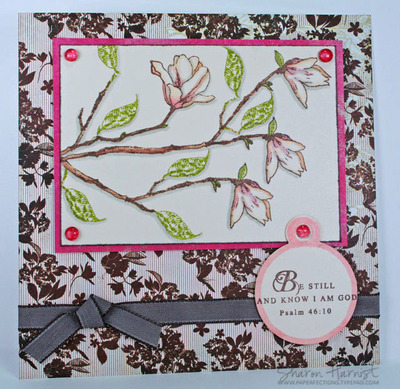 I'll be back tomorrow with a sample from Flourishes beautiful new floral set -- goodness, the week is almost over! This set is available for purchase beginning today. I adore this vintage style line art -- it begged for this scratched olive and floral vintagey paper from BasicGrey (Sugared collection). 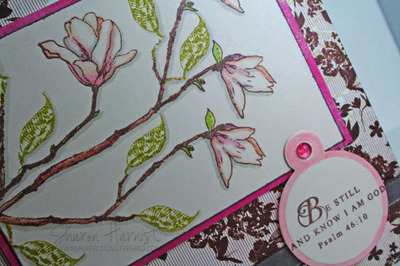 I really liked Papertrey Ink's Spring Moss satin ribbon to tie this card all together. I used CPS #64 for the layout. As others have raved about this new ink, I found it worked fabulously with Copics -- no smearing whatsoever! The moon image was popped up on a floral circle cut with Spellbinders Nestabilities Petite Scalloped Circles and was mounted to a Sugar Plum Memory Box notecard. Island Blossom Dew Drops help balance out the sentiment that was also stamped in the Memento Rich Cocoa ink. I'll be back a bit later to add a link to a news release with a fabulous announcement from Flourishes! ETA: Here's a link to the news release! Be sure to check back in over the next few days, as I'll have some more samples with this set (you haven't seen it all yet!) and that gorgeous new floral set that will also be relased for sale today! Today's card is a quick, simple wedding card. I made it for my cousin's son's wedding a few weeks ago, sent it off, and totally forgot to post it! It's made with Flourishes' Wedding Essentials set. I heat embossed the rings with Versamark and gold embossing powder onto shimmer white cardstock and cut them out with Spellbinders Nestabilities Classic Scalloped Squares. Then I did my inlaid trick by cutting out the same scalloped square from gold metallic cardstock and laying the white square into the gold piece. 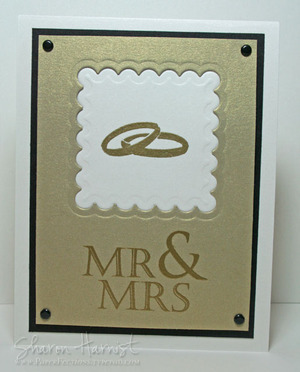 The Mr. & Mrs. was also heat embossed in gold onto the gold cardstock. This whole layer is popped up on foam dimensional tape. Black brads finish it off. The black mat is flush against the white shimmer card base (A2-sized). Speaking of Flourishes . . . are you ready for another new stamp release from them? I just started playing with some new sets that will be released next Wednesday, May 14 and I know you will love them! Some more gorgeous flowers are coming your way, along with THE cutest/elegant baby set I've ever seen! I'll be back in a bit with a cool new tool/trick I learned about this past weekend! Look Mom, no designer paper -- can you believe it?! I worked with a color challenge today, using guava, blush & dark gray, so it's a little difficult to find just the right paper that will match a combo like that! Here's the link to the SplitcoastStampers color challenge, if you'd like to try it out. All stamps are from Flourishes and were new releases just last week. Ribbon and all cardstock from Stampin' Up! The dark gray flourish on the guava (left) panel is from the Wedding Essentials set and the dark gray flourish background on the right panel (stamped on blush cardstock with dark gray ink) is Reverse Damask. 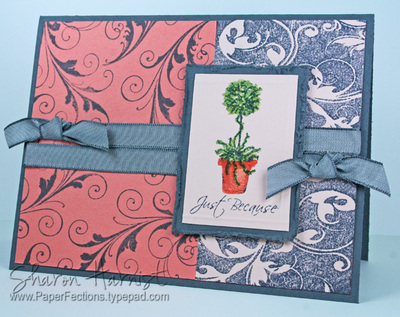 The cute topiary and sentiment are from the Siberian Iris set I used last week. I stamped it in SU's Basic Gray dye ink on blush cardstock and then watercolored the image with guava and celery reinkers. Olive Copic Spica glitter pen was used to accent the topiary. I dry embossed the edges of this focal image with my Fiskers trimmer scoring blade and then matted it with a distressed piece of SU Basic Gray cardstock. It's popped up on dimensional foam tape. If you'd like to play along with today's SplitcoastStampers sketch challenge I used, here's that link. 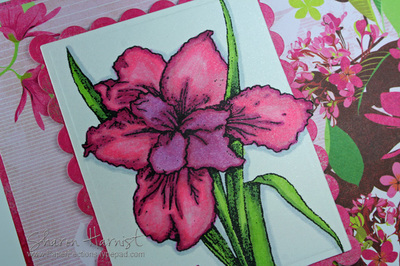 Today's softer, shabbier iris card is a little more "me", I think! The edges of the image were distressed with Tonic's Edge Distresser and then machine stitched to Stampin' Up's Cocoa mat. 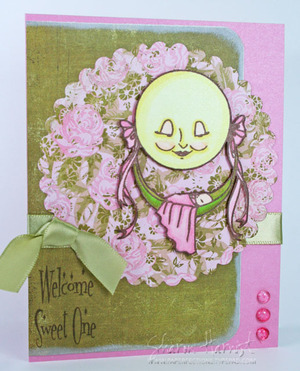 The background is Flourishes' Reverse Damask stamped with ColorBox Chestnut Roan fluid chalk ink on SU's Pretty in Pink cardstock. 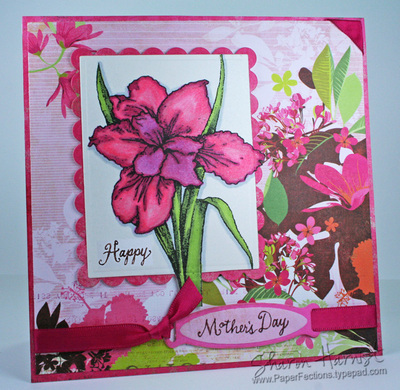 The "Just Because" sentiment is included in the set, which makes it very versatile and not just for Mother's Day. It is stamped in the same Chestnut Roan ink on cream cardstock, cut with Spellbinders Petite Scalloped Oval Nestabilities. Pink brads and ribbon are Stampin' Up! 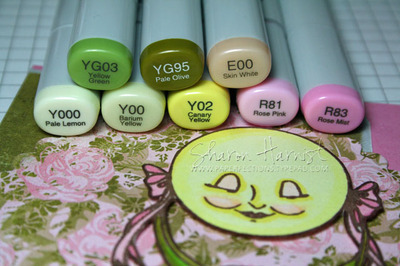 Note: I've added a Word document of the Copic Color Chart to this post. Hopefully that might help some of you who couldn't download the Excel file. Check back in tomorrow for Beate's Weekend Sketch Challenge! Wow, this card turned out very bright! But I was inspired by the colors in this new Sultry paper by BasicGrey. It also turned out large -- 6" square by the time I got everything on it I wanted! But this card will be for my Mom for Mother's Day, so that's okay. I'm honored to be working with Flourishes during April & May and looking forward to using their gorgeous stamps I've had my eye on for quite some time. This new Siberian Iris set is available starting today. None of the Siberian Iris I Googled were these colors, but I had fun coloring it to match my paper! The beautiful bright pink satin ribbon is by May Arts and really does match the pinks in the paper, but it's looking red on my monitor. Along with tying the tag on my card, I also made a corner out of it for the upper right corner of my card. The tag is Spellbinders new Ribbon Tags Trio. Flourishes had them in stock briefly last week, are currently sold out but awaiting another shipment soon. If this project is too bright for you, check back in the next few days and I hope to have a little more subdued sample!